Anton Johannes Gerrit Corbijn van Willenswaard (Dutch pronunciation: [ˈɑntɔn joːˈɦɑnəs ˈɣɛrɪt kɔrˈbɛin vɑn ˌʋɪlənsˈʋaːrt]; born 20 May 1955) is a Dutch photographer, music video director and film director. He is the creative director behind the visual output of Depeche Mode and U2, having handled the principal promotion and sleeve photography for both bands over three decades. Some of his works include music videos for Depeche Mode's "Enjoy the Silence" (1990), U2's "One" (version 1) (1991), Bryan Adams' "Do I Have to Say the Words? ", Nirvana's "Heart-Shaped Box" (1993) and Coldplay's "Talk" (2005) and "Viva la Vida" (2008), as well as the Ian Curtis biographical film Control (2007), The American (2010), and A Most Wanted Man (2014), based on John le Carré's 2008 novel of the same name. Anton Johannes Gerrit Corbijn van Willenswaard was born on 20 May 1955 in Strijen in the Netherlands, where his father had been appointed as parson to the Dutch Reformed Church the previous year. His father, Anton Corbijn van Willenswaard (1917–2007), took up the same position in Hoogland (1966) and Groningen (1972), moving his wife and four children with him. His mother, Marietje Groeneboer (1925–2011), was a nurse and was raised in a parson's family. Photographer and director Maarten Corbijn (born 1960) is a younger brother. Grandfather Anton Johannes (Corbijn) van Willenswaard (1886–1959) was an art teacher at Christian schools in Hilversum and an active member in the local Dutch Reformed Church in Hilversum. Corbijn began his career as a music photographer when he saw the Dutch musician Herman Brood playing in a café in Groningen around 1975. He took a lot of photographs of the band Herman Brood & His Wild Romance and these led to a rise in fame for Brood and in exposure for Corbijn. From the late 1970s the London-based New Musical Express (NME), a weekly music paper, featured his work on a regular basis and would often have a photograph by him on the front page. One such occasion was a portrait of David Bowie wearing a loincloth backstage in New York when starring in The Elephant Man.. In the early years of London-based The Face, a glossy monthly post-punk life style / music magazine, Corbijn was a regular contributor. He made his name photographing in black-and-white but in May 1989 he began taking pictures in colour using filters. His first venture in this medium was for Siouxsie Sioux. Between 1998-2000, in collaboration with the painter Marlene Dumas, he worked on a project called "Stripping Girls", which took the strip clubs and peep shows of Amsterdam as their subject; while Corbijn later exhibited photographs, Dumas took Polaroids which she then used as sources for her paintings. Corbijn has photographed Bob Dylan, Joy Division, Depeche Mode, Tom Waits, Bruce Springsteen, Prāta Vētra, Peter Hammill, Miles Davis, Björk, Captain Beefheart, Kim Wilde, Marc Almond, Robert De Niro, Stephen Hawking, Elvis Costello, Siouxsie and the Banshees, Morrissey, Peter Murphy, Simple Minds, Clint Eastwood, The Cramps, Roxette, Herbert Grönemeyer, Annie Lennox, and Eurythmics, amongst others. Perhaps his most famous and longest standing association is with U2, which includes taking pictures of the band on their first US tour, taking pictures for their albums The Joshua Tree and Achtung Baby albums (et al. ), and directing a number of accompanying videos. Other album covers featuring work by Corbijn include those for Springsteen, Nick Cave, Siouxsie's second band The Creatures, Bryan Adams, Metallica, Therapy?, The Rolling Stones, Bon Jovi, The Killers, Simple Minds, R.E.M., The Bee Gees, Saybia, Clannad and Moke. Corbijn began his music video directing career when Palais Schaumburg asked him to direct a video. After seeing the resulting video for Hockey, the band Propaganda had Corbijn direct Dr. Mabuse. After that he directed videos for David Sylvian, Echo & the Bunnymen, Golden Earring, Front 242, Depeche Mode, Roxette and U2. His first video in colour was made for U2 in 1984 for their single "Pride". 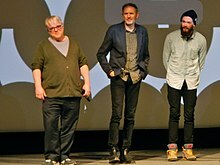 In 2005 Palm Pictures released a DVD collection of Corbijn's music video output as part of the Director's Label series. In 1994 Corbijn directed a short film about Captain Beefheart/Don Van Vliet for the BBC called Some Yoyo Stuff. He made his feature film debut with Control, a film about the life of Joy Division frontman Ian Curtis. It premiered to rave reviews at the Cannes Film Festival on 17 May 2007. The film is based on Deborah Curtis' book Touching from a Distance about her late husband and the biography Torn Apart by Lindsay Reade (Tony Wilson's ex-wife) and Mick Middles. Although shown outside the Palme d'Or competition, Control was the big winner of the Director's Fortnight winning the CICAE Art & Essai prize for best film, the "Regards Jeunes" Prize award for best first or second directed feature film and the Europa Cinemas Label prize for best European film in the sidebar. It also won the Michael Powell award for best new British feature at the Edinburgh International Film Festival. In 2010, Corbijn returned as a director with the character-based thriller The American, starring George Clooney. On 26 October 2011, Corbijn directed a webcast by Coldplay from the Plaza de Toros de Las Ventas in Madrid, Spain. His film A Most Wanted Man was released in 2014. The John le Carré novel of the same name, which is loosely based on the true War on Terror story of Murat Kurnaz, was set in part in Hamburg, as parts of the movie were. In February 2014, he started filming his next project Life about James Dean and photographer Dennis Stock. Author William Gibson refers to a fictitious portrait by Corbijn of the character Hollis Henry in his 2007 novel Spook Country. A Corbijn photograph has served as the author's portrait on many of Gibson's books, including Neuromancer. Corbijn is the subject of Josh Whiteman's 2009 documentary film Shadow Play – The making of Anton Corbijn. In May 2011 Corbijn presented Mandela Landscape, an artwork consisting of Corbijn's portrait of Nelson Mandela stitched by Dutch textile artist Berend Strik. Both the original work and 80 signed art prints will be sold to fund the international edition of ZAM Magazine, an independent platform of African talent. On 19 December 2011, he was announced as being on the jury for the 62nd Berlin International Film Festival, scheduled to be held in February 2012. At this occasion, the Berlinale Special screenings at the Haus der Berliner Festspiele will screen Anton Corbijn – Inside Out, an 80 min-documentary. Inside The American. Schirmer/Mosel, 2010. ISBN 9783829604765. Inwards and Onwards. Schirmer/Mosel, 2011, ISBN 9783829605588. Waits/Corbijn '77–'11. Schirmer/Mosel Verlag, May 2013, ISBN 9783829605557. Looking at A Most Wanted Man. Mosel Verlag, June 2014, ISBN 9783829606493. ^ "Historische Kranten – actualiteiten uit het verleden". Kranten.kb.nl. 15 July 1954. Retrieved 29 April 2013. ^ "Ds. A. Corbijn overleden – Kerknieuws – Kerk & Religie". Refdag.nl. 12 November 1917. Retrieved 29 April 2013. ^ "PROTESTANTSE KERK". Nederlands Dagblad. 22 September 2011. Retrieved 29 April 2013. ^ Corbijn, Maarten. "Corbino". Corbino.nl. Retrieved 2 September 2013. ^ "Historische Kranten – actualiteiten uit het verleden". Kranten.kb.nl. 22 February 1985. Retrieved 29 April 2013. ^ "Abraham Corbijn van Willenswaard | 23258806". Wiewaswie.nl. Retrieved 29 April 2013. ^ "Stamboom van abraham corbijn van willenswaard – Website: (corbijn)vanwillenswaard ť". Uwstamboomonline.nl. Archived from the original on 12 January 2014. Retrieved 29 April 2013. ^ "Historische Kranten – actualiteiten uit het verleden". Kranten.kb.nl. 28 June 1911. Retrieved 29 April 2013. ^ "Historische Kranten – actualiteiten uit het verleden". Kranten.kb.nl. 16 November 1928. Retrieved 29 April 2013. ^ "Historische Kranten – actualiteiten uit het verleden". Kranten.kb.nl. 23 October 1937. Retrieved 29 April 2013. ^ "HERMAN BROOD | Anton Corbijn" (in Dutch). Retrieved 28 May 2016. ^ Marlene Dumas, Feathered Stola (2000) Christie's Post War and Contemporary Evening Sale, 9 May 2006, New York. ^ "Ian Curtis biopic scoops top award at Edinburgh". The Guardian. 27 August 2007. Retrieved 14 August 2017. ^ Roxborough, Scott, "'The American' Helmer Anton Corbijn to Direct John Le Carré Adaptation 'A Most Wanted Man'", The Hollywood Reporter, 19 June 2011 5:33 AM. Retrieved 26 July 2011. ^ "Robert Pattinson and Dane DeHaan join Anton Corbijn's Life". Screendaily. Retrieved 18 February 2014. ^ Gibson, William. Neuromancer. ISBN 0-441-56959-5. ^ "Mandela Landscape - ZAM". www.zammagazine.com. Retrieved 28 May 2016. ^ "A Most Wanted Man (2014) - Box Office Mojo". ^ "Inside The American". GUP Magazine. 12 November 2010. ^ Matthews, Katherine Oktober (12 October 2011). "Inwards and Onwards". GUP Magazine. ^ "Waits Corbijn The Book". Waits-corbijn.com. Retrieved 1 August 2013. ^ "Waits/Corbijn '77-'11". GUP Magazine. 14 July 2013. ^ Matthews, Katherine Oktober (29 September 2014). "Looking at A Most Wanted Man". GUP Magazine. Wikimedia Commons has media related to Anton Corbijn.